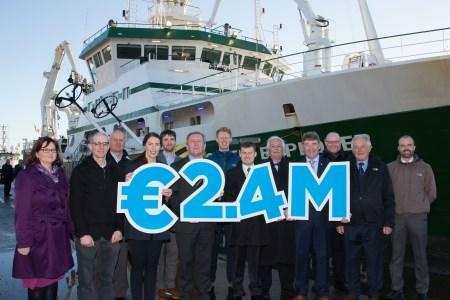 The Minister for Agriculture, Food and Marine, Michael Creed TD has announced that the Marine Institute is to provide twelve marine businesses (in collaboration with five universities) with investment funding totaling €2.4 million over 3 years. The funding is being provided to drive continued innovation in Ireland’s ocean economy, a key requirement of the Marine Institute led, National Marine Research and Innovation Strategy (2017-2021). The twelve grants of up to €200,000 each which are being provided to individual companies and company-led consortia will support novel R&D and the development of new technologies in key growth areas such as marine engineering, renewable energy and the blue bioeconomy. Marine Institute CEO Dr. Peter Heffernan said, “The Marine Institute is committed to assisting industry-led development through knowledge transfer, capacity building, research and Innovation. This investment in industry-led research is a key deliverable of the Marine Institute Strategic Plan 2018-2022: Building Ocean Knowledge, Delivering Ocean Services. Job creation in the marine sector is increasing as a result of such investment and Irish marine companies have built an excellent reputation internationally for innovation and best practice. The 12 companies receiving funding through this funding call have demonstrated the demand and capability to fuel further growth through marine research,”. Increased economic growth and job creation from small and medium sized enterprises based in Ireland is a key component of several national strategies and regional development plans. These awards will be carried out with the support of the Marine Institute under the Marine Research Programme 2014-2020 funded by the Irish Government, co-financed by the European Regional Development Fund (ERDF) and part of the Regional Operational Programmes. A diverse range of companies applied to the Marine Institute, following the launch of its Industry-led call in May 2018. Awards have been approved for companies operating in a range of marine sectors including companies such as SolarMarine Energy, Gavin & Doherty Geosolutions, Subsea Micropiles, Marine Materials Ltd, Exceedence Ltd, w1Da Experience and Resolute Marine. Bioresources processing company, Bio-marine Ingredients Ltd, was awarded funding, while advanced technologies companies, Xocean Ltd and IDS Monitoring and marine engineering companies Technology from Ideas and Ocean Energy were also successful in their funding applications.